H.M.S. 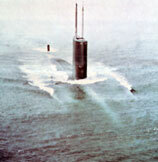 Courageous was the last of the Valiant Class submarines. She was built by Vickers (Shipbuilding) Limited at Barrow-in-Furness. 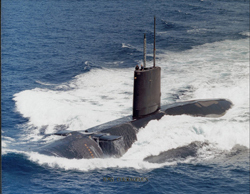 Her keel was laid down on the 15th of May 1968 and she was launched on the 7th of March 1970 as S50 (SSN06). At a ceremony held at Vickers, she was commissioned into the Royal Navy Submarine Flotilla on the 16th of October 1971. Courageous was a formidable underwater weapon. 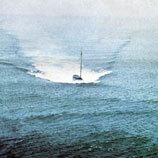 Her time submerged was limited only by the food that could be carried and the endurance of the crew. Her nuclear reactor was a virtually limitless power supply driving both the propulsion and the life support systems onboard. Making fresh water and even oxygen from the sea water around her, she could remain beneath the surface for months at a time. 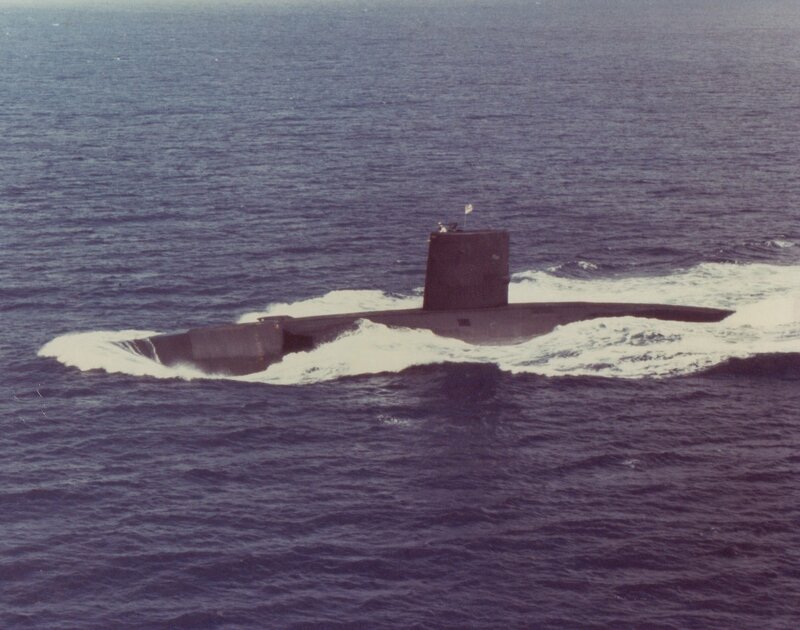 Her sonar allowed Courageous to listen quietly for the sounds made by other ships and submarines and her weapons meant that she carried a real sting with which she could both defend and attack. The small nuclear reactor (about the size of a household dustbin) provided heat to produce steam for the turbines which drove the propellor as well as for the turbo generators which produced enough electricity to supply a small town. 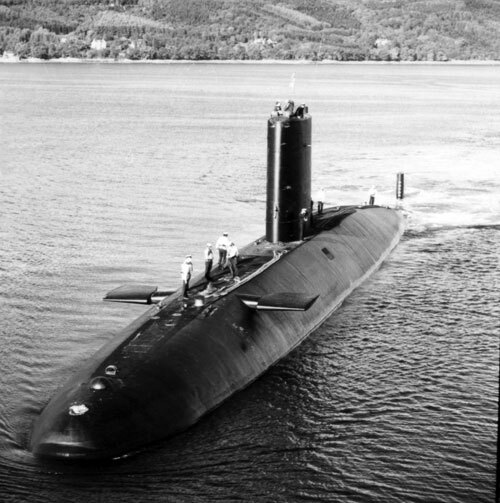 Courageous was based at Faslane Submarine Base situated on the Gareloch in Western Scotland throughout her operational career as part of the Third Submarine Squadron. She conducted many Cold War patrols, mostly in the North Atlantic. 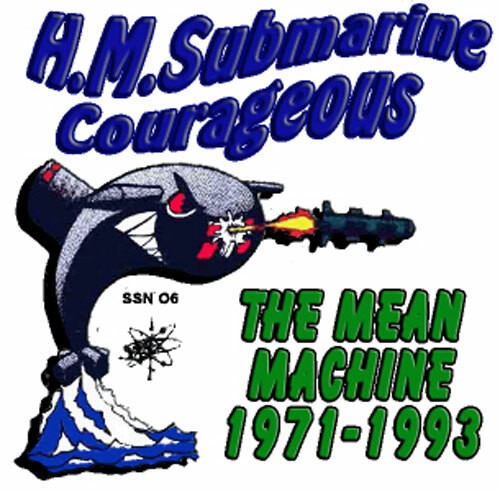 Her crew named her “The Mean Machine”€� and the nickname was to remain with her throughout her service. Many of the T-shirts bore the cartoon designed by the crew. Her ship’s journal, many editions of which are classified, bore the ship’s mascot, Hissing Sid also known as The Werm derived from the snake depicted in the ship’s badge. Although we would love to publish those newsletters here we are unable to do so because of their content and the Official Secrets Act. During her first commission Courageous completed six long patrols and, in addition, a Mediterranean patrol, winning the “Hook ‘Em Award”€� from the United States Navy for her excellent surveillance work. She also completed numerous shorter North Atlantic Cold War patrols and made visits to, among other places, Corfu, Gibraltar and Liverpool, Barry Island, Hull and Bergen. As you can see, there was not a great deal of time for the crew to enjoy foreign visits during the very busy first commission. Courageous underwent a major refit in Chatham from September 1976 to August 1978 following which she returned to operational duties. She was then to become the trials submarine for the Royal Navy Sub-Harpoon missile and was based at San Diego in the USA for nine months. During the Falklands Conflict of 1982 Courageous served in the South Atlantic, carrying out no less than four patrols in the area. 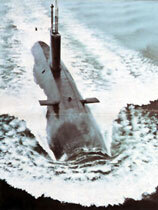 During this second commission Courageous and her crew also carried out two deployments to the Mediterranean and, in addition, visited San Diego, Charleston, San Francisco, Wilemstad, Curacao, Liverpool, Hull, Bremerhaven, Bermuda, Haifa (probably the only nuclear submarine ever to visit Israel), Corfu, Naples, La Maddalena and, of course, Gibraltar. In 1984 another refit took place, this time in Devonport, Plymouth. 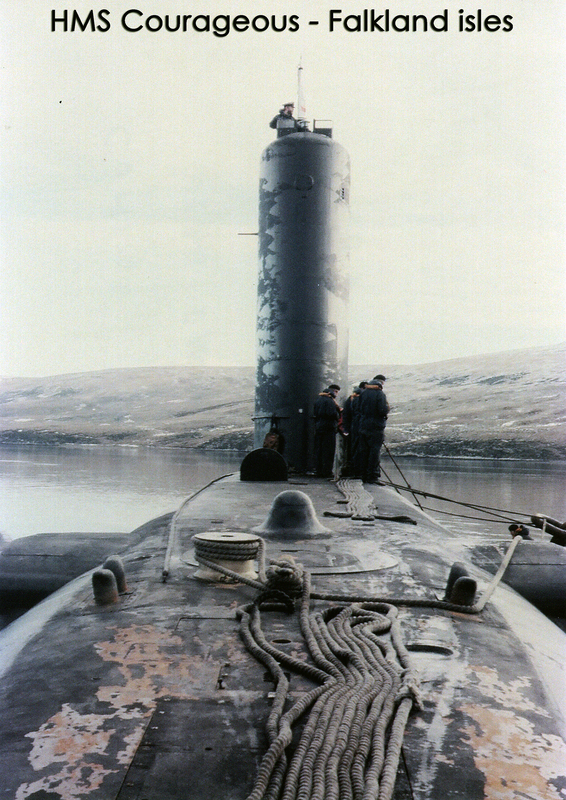 She again returned to operational duties in January 1987 and served the fleet for another five years undertaking Spearfish Torpedo Trials visiting the American Underwater Test and Evaluation Centre (AUTEC) on three occasions and visited Cape Canaveral, Fort Lauderdale, Liverpool, Bermuda, Stavanger and Gibraltar. The boat’s vital statistics are impressive. Courageous was finally paid off at Devonport in April 1992 where she was fully de-fuelled and laid up. In 2002 she was removed from mothballs and moved to No. 3 Dock where she was open to the public as a unique exhibit in the UK. Ongoing problems with the caissoon, which seals the dock, necessitated her move back to 3 Basin in 2007 where she is currently once again open to the public. In 2012 Courageous celebrated 10 years service as the only nuclear submarine on public display in the United Kingdom and one of only 2 in Europe (the other is the French ballistic missile submarine Redoubtable in Cite de la Mer museum in Cherbourg).